Recently, a survey was conducted to determine the purchasing decisions of B2B buyers. The findings showed that by the time a prospective customer speaks to your business, they are, on average, already 57% of the way through their decision-making process. They’ve shopped around. They’ve looked at you and your competitors and know what they need and how much they’re prepared to pay. This means there is less time for you as a business to influence purchasing decisions. The current state of buying behavior is in the hands of the purchaser and less in the hands of your business. You can’t just wait around, hoping your target market will find the right information and decide on your product or service. Stop defending and start taking an active approach, stepping in and giving prospective buyers the knowledge they need to make the right decision. This can be done through the creation of a B2B buyer’s guide that will provide you with a plan of action for your B2B lead generation activities. In this article I’m going to explain what a buyer’s guide is, what the modern state of the buying process looks like, and how you can use this guide to generate highly qualified leads that are ready to buy. What is a buyer’s guide and why is it important? What does the buying process look like? Sound good? Let’s get cracking. A buyer’s guide exists to assist businesses and individuals alike in their buying decisions. It’s like a pamphlet on steroids - providing all the necessary information and comparisons a person needs to choose a solution to their problems. You’re giving them what they need in order to make an informed decision on the solution that is right for them. In your B2B buyer’s guide you’ll include things like product specifications, comparisons of similar products and customer testimonials. Your job is to answer any objections a person has by giving a detailed account of exactly what your product or service provides. They might think they need to go with the industry leader because they must be the only ones that offer a specific service. When you can show in the buyer’s guide that many companies, regardless of size offer the same services (for a lower price) you can help sway their decision. There are two main types of buyer’s guides that are used. There’s one you can create on your own (I’ll be showing you step-by-step how to do that later in the article) or you can advertise in an association’s buyer’s guide. These guides are industry-specific and are geared towards a targeted audience that is actively seeking out your offer. What does the modern buying process look like? The B2B buying process has changed and your business needs to change along with it. This section will outline the buying process and how a buyer’s guide can add validation to your sales funnel to help prospects feel confident about purchasing. Let’s say you’re a marketer tasked with finding a way to decrease your cost-per-lead. You start by doing some research on search and social but are overwhelmed with the findings. As valuable as you believe a one-on-one demo from each individual company would be, you just don’t have the time and you need a solution now. You can place a buyer’s guide in front of this marketer to help facilitate the buying process. In your buyer’s guide, discuss the risks and benefits of using your company in comparison to other businesses and specifically how your product will answer their every need. They’re researching the options that will be the best solution for their business. This process is happening at the evaluation section (see below). Your buyer’s guide will show them why your company is right for them as opposed to others. The B2B buying process is completely different than it was 10, 20, 30 years ago. The focus was on interrupting a prospect at a time when they had a problem through cold calling, direct mail etc - it was a numbers game. A salesperson would be responsible for sourcing businesses, making calls, setting up meetings and selling the solution. The salesperson was in control of the buying process because they held all of the information. It doesn’t work like this today. Now, information is everywhere and the buyer is more determined than ever to make sure they’re getting the best deal and solution. Make it easy for them to get all of the information they need to make an informed decision with a buyer’s guide. Now that you can see why it’s so important to use a B2B buyer’s guide to influence purchasing decisions, I’ll show you how to create your own. The way you present your guide is not set in stone. You can change the order of your guide to suit your business and buyers. The main goal of your buyer’s guide is to facilitate a clear and informed decision. There are three things you need to include at the beginning of your guide to do this. 1.) A straightforward title. Incorporate the phrase “buyer’s guide” with what your business’ solution is (ie. Marketing automation, CRM, etc). In the subtitle you can further specify who your guide is for. 2.) A simple introduction. The introduction should answer in the simplest way, “What is this buyer’s guide about?” Make it concise but interesting enough to show someone whether or not this solution will suit their needs or not. Your entire guide (and I’ve seen some that are more than 60 pages) needs to be summed up in one or two paragraphs. 3.) Table of contents. You can keep your table of contents simple by just showing the chapter headings or, if you have a complicated service, show in-depth what you’ll be covering in each section. For example, if your buyer’s guide is on lead generation and one of the sections is on using popups to generate leads you could have sub-sections to show the types of popups you offer. The example below from TrustRadius shows how you can simply display these three in the opening section of your buyer’s guide. Following your introduction, dive deeper into what your solution is. This section is meant to educate B2B buyers on why they need your product or service. Go beyond basic definitions (though include those too) and explain the benefit buyers will gain from using your solution. 1.) Provide a definition of the umbrella term. 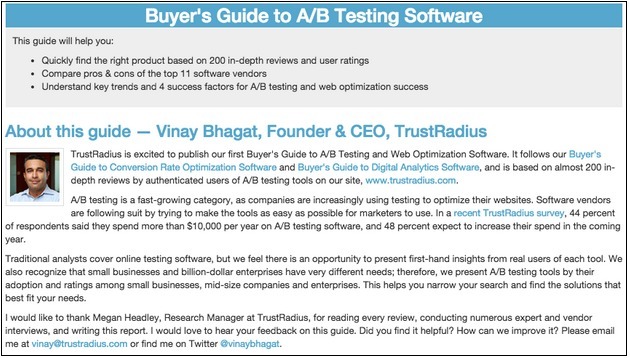 If the buyer’s guide was on email marketing automation, define what marketing automation is. Chances are the buyer will have an idea that they need to use it but they won’t always know why. 2.) Provide further details. How is your solution going to benefit the prospective business? With marketing automation you might say that it decreases costs because it makes the sales funnel more efficient and saves time. It makes it easier to set up campaigns, manage clients and assist your sales team, maximizing revenue and accountability. 3. )Let them know when they should start using your solution (now). Once you’ve let them know what they stand to gain from using your solution don’t let them wait. Push that using your product or service now is always better than later. Don’t just say it, get them to take an assessment and help them realize why they need to implement your product or service right away. This section is meant to increase the legitimacy of the solution you’re selling. Include stats, customer testimonials and probing questions to get them thinking about why your solution is right for them and push them in the right direction. You want to probe the “why” behind a person’s purchasing decision. The example chart below is from a marketing automation buyer’s guide. In it they show that 41% of marketers were, as of 2014, using marketing automation software in their business and that 26% are planning to use it in the future. 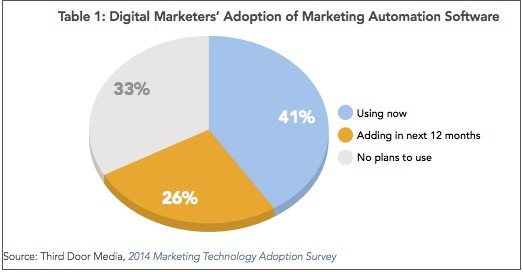 This chart makes prospective B2B buyers feel like they should start using marketing automation to keep up with digital trends. 2.) Customer testimonials and big name business who are already using your solution. In particular you can highlight customers who use your services (especially the most successful ones). Showing how other businesses have been successful will help convince someone why they should go with you as opposed to your competition. A comparison chart will make it easy to see if your product or service is right for a prospective customer. For many businesses this means listing the features and benefits of your business’ competition as well as your own. This will allow people to easily browse which companies have the features they need. There’s little point in convincing someone to go with your company when you can’t actually provide the solution their problem. 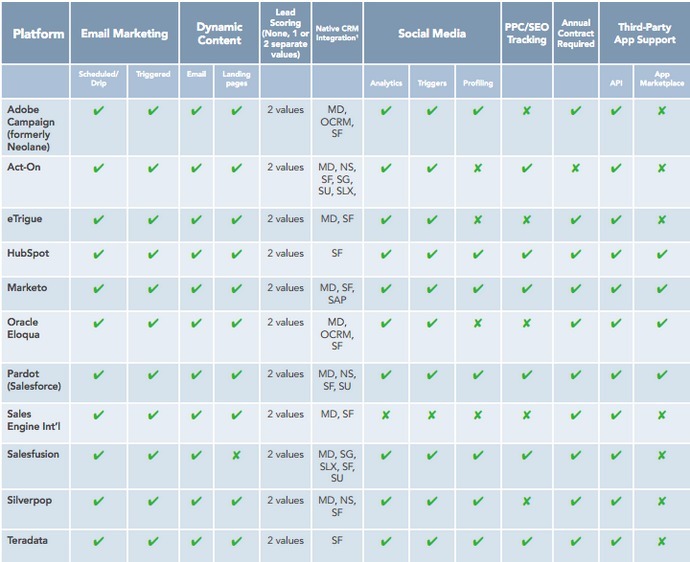 The example below lists various marketing automation companies. Following the chart, each section would be explained in paragraph form so B2B buyers can decide whether or not it’s important to have for their business. The buying process has changed and you need to change along with it. By creating a B2B buyer’s guide you’ll be able to influence the decisions of prospective customers in your industry, thus making more effective your B2B lead generation efforts. If you’re informative, straightforward and give all of the possible solutions to a problem a business is having you’ll make it easier for them to see you have the right solution. Have you ever used a buying guide to generate qualified leads? Comment below! When Samantha isn’t crushing content at Wishpond she performs with her burlesque troupe, casts spells in dungeons and dragons and enjoys baking and eating cookies.